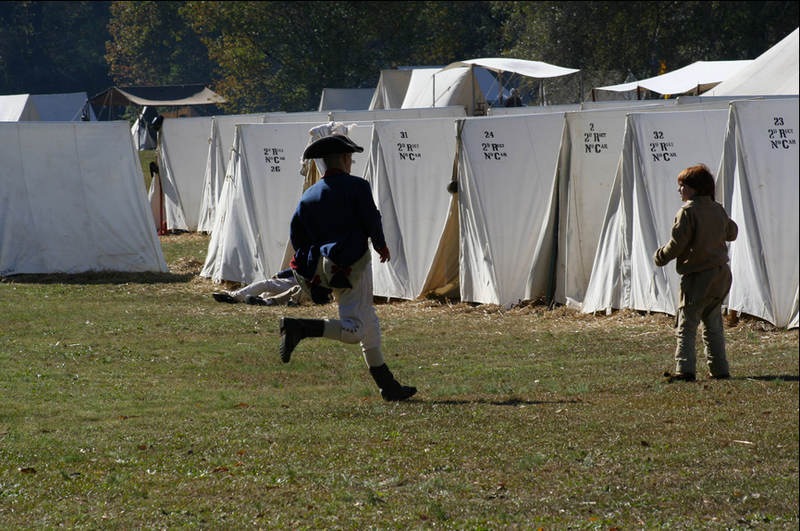 As just about anyone who has checked out my blog would see coming from a mile away, I have finally taken the plunge and will participate in my first reenactment at the Battle of the Hook. I will be joining Patrick O’Kelley’s 2nd North Carolina Regiment this coming weekend. The regiment will be depicting “Mercer’s Select Grenadier Battalion” that saw most of the infantry action during the battle. If predictions hold out, this event may even see the largest contingent of cavalry for a Revolutionary War reenactment ever. The American victory at ‘The Hook’ shut Cornwallis in Yorktown and threw away the key, effectively ending the British general’s hopes for escape or reinforcements (thanks should also be given to the French fleet). The dreaded Banastre Tarleton partook in the battle and was injured as Mercer’s Select rushed in to support French cavalry. The 2nd North Carolina regiment will feed, cloth, arm and shelter both Wesley and I.
Patrick O’Kelly will train us upon arrival. With any luck, I’m hoping he won’t break into spats of cursing in German like Von Steuben did. My musket will pass muster this time, although technically the 1777 Charleville was not issued to Continentals. If asked, I’ll stick with the story that I ‘borrowed it’ from the generous French contingent. Or maybe won it in a bet. Not sure yet. A period correct Tavern will be present at this event. I will be sure to practice period correct consumption, hopefully not leading to a case of period correct ‘the consumption’. The reenactments will include redoubts and two buildings that will be burnt down during the battle. The 11 year old in me just jumped with joy upon discovering this. Shaved the beard. Sad faces from my wife and 11 year old daughter upon discovering my cleanhsaveness this morning. But worth it to see the confused look on my one and two year old boy’s faces. Must keep out of view my sleeping bag and anything that is not period correct. Once the public is gone however, I plan on taking plenty of pics. Vids too. Gloucester Virginia. 9 hr drive. Ouch. Bert Puckett Started reenacting with his family in 1976. What started as weekend family outings quickly turned into a life long passion. Bert has portrayed infantry, artillery and cavalry in his life long search for knowledge of American Colonial times and birth of our nation. Bert retired from the Army as a Command Sergeant Major after 25 years. He currently reenacts with the Third Light Dragoons with his son Hunter and his wife Chris. 1. How did American cavalry contribute to the victory at Cowpens? Dragoons added a much needed punch for the infantry to exploit. In the two charges at Cowpens, the Third Light Dragoons managed first to save the militia that was retreating from being run over by the British 17th Dragoons and eliminating the 17th as a viable fighting force for the rest of the battle. During its second charge the Third charged British forces that were reeling from a deadly volley of musketry and managed to totally surround part of the British force. 2. Approximately how many cavalry (on both sides) participated at the battle? There was a total of 482 mounted men on the field at Cowpens. (+or- ) 182 American horse composed of the Third Light Dragoons and various mounted militia units from North and South Carolina. There was about 300 British Dragoons from the 17th Light Dragoons (British) and the British Legion (the British Legion was composed of Loyalist Americans primarily recruited in New York State). 3. What different types of cavalry were employed during the battle? The cavalry on both sides were know as “Light Dragoons”. Light Dragoons were to be used in scouting and reconnaissance roles. How ever during the Revolutionary war, Light Dragoons were used as heavy cavalry in places like Cowpens, Guilford Court House and Eutaw Springs. Banastre Tarleton was a master of using the lightning speed and the massive punch of mounted men in battle. 4. Tell us a little about William Washington, the American cavalry leader at the battle of Cowpens. William Washington was the second cousin of His Excellency George Washington. He was born into the Virginia aristocracy and his family owned and farmed a 1200 acre plantation. Being the second son Washington was not the heir to the plantation. Nothing has been found to tell us much of Williams young life. We do know however that as a young man William Washington decided to enter training as an Episcopal minister. However by the turbulent 1770’s Washington was being drawn into the conflict that would define his life. 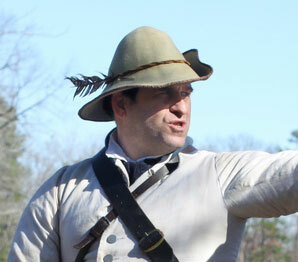 He joined the Virginia Militia soon after the “shot heard ’round the world” at Lexington Green. On Sept 12 1776 he was elected as Captain of the Stafford County Militia. His militia unit was soon designated as the 3rd Virginia Continental Regiment. (Infantry) The 3rd Va was ordered north in the summer of 76 were he participated in the battle of Harlem Heights where he received his baptism of fire. He also participated in the crossing of the Delaware that Christmas. In January of 1777 the Continental Congress authorized that four regiments of Dragoons were to be raised. William Washington was at that time commissioned as a Major in the Fourth Light Dragoons under Colonel Moylan. 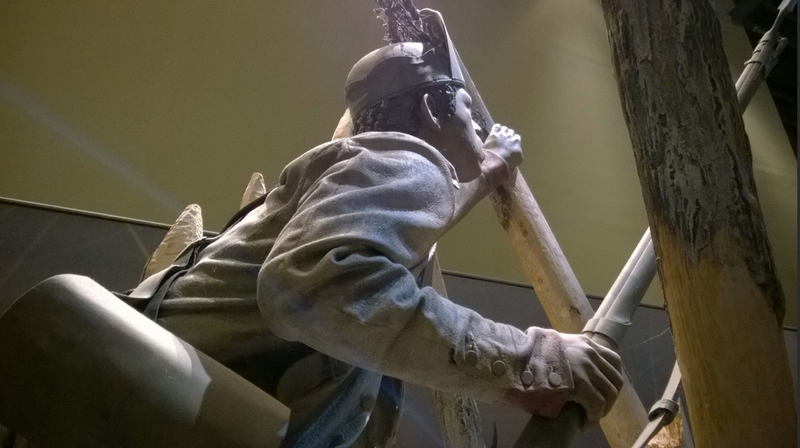 It was with this unit that Washington fought with through the entire Philadelphia campaign. On Sept 28th 1777 The 3rd Light Dragoons were Devastated by a night time raid led by General Charles (no Flint) Grey. The commander of the Third Dragoons, Colonel George Baylor was gravely wounded and captured. General George Washington was shocked at the brutality of the attack and the loss of his friend Colonel Baylor but quickly realized that new commander would be needed too rebuild and train the remains of the Third Dragoons. Being a Virginia based unit, the choice was a natural one: he selected his cousin William Washington. 5. What are weapons commonly wielded by cavalry? What are some techniques for using them? The American Dragoons being under supplied primarily relied on the saber. Pistols were used primarily for signaling and were extremely inaccurate beyond anymore than a few yards. If used from the back of moving horse the accuracy was negligible. Longer length carbines were rare in the American Dragoons, However, the British made use of them to a degree when dismounted. Using two hands to fire a carbine simply wasn’t practical. But above all the Horse was the primary weapon of the cavalry. 6. What kind of horses did they ride? Dragoons of the time were mounted on small light horses capable of long distances. Usually these horse were Quarter Pacers or Thoroughbreds rarely over 15 hands in height. 7. Was is the worst fear of the cavalry man? The worst fear of the mounted soldier was to be caught in camp with his mount unbridled and unsaddled. This happened the the Third Dragoons three times during the war (Tappan Farm, Monck’s Corner and Lenudes Ferry). 8. How did troops commonly defend against cavalry attacks? Disciplined infantry could defend against a cavalry attack by closing ranks and forming a square with both the front rank presenting their bayonets to the front while the rear rank fired at will. Another well used technique used more often in the war was for the infantry to fall back into very thick woods were mounted men could not follow (Eutaw Springs). 9. What are some common misconceptions about 18th century cavalry? Unlike the movies, a cavalry charge was not a head long gallop from start to finish. Strict order was essential to achieve the desired speed and shock and therefore charges typically began at a trot and progressed to a canter. A gallop wasn’t called for until fifty yards from the target. 10. What is the strangest question you’ve received during a demonstration? Do you really sleep in those tents? Is that your horse? 11. In your opinion, who was the greatest cavalry leader/fighter or horseman of the Revolutionary war? There were many horsemen of the time that were exceptional. But the two that stick out for their aggressive nature would be William Washington for the Americans and Banister Tarleton for the British forces. William Washington learned extremely fast how maneuver his men. Tarleton was super aggressive and was rarely beaten in the field. 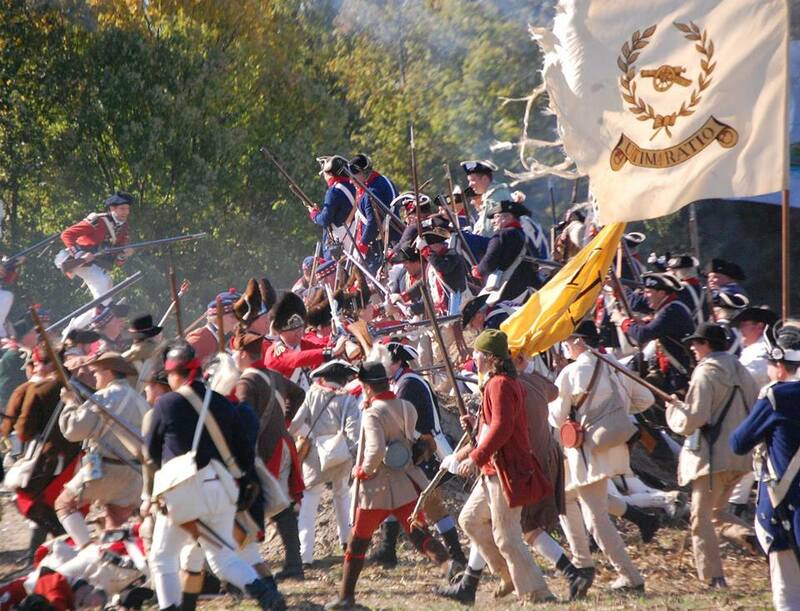 Be sure to visit Bert and his companions at the 233rd anniversary of the battle of Cowpens January 2014. 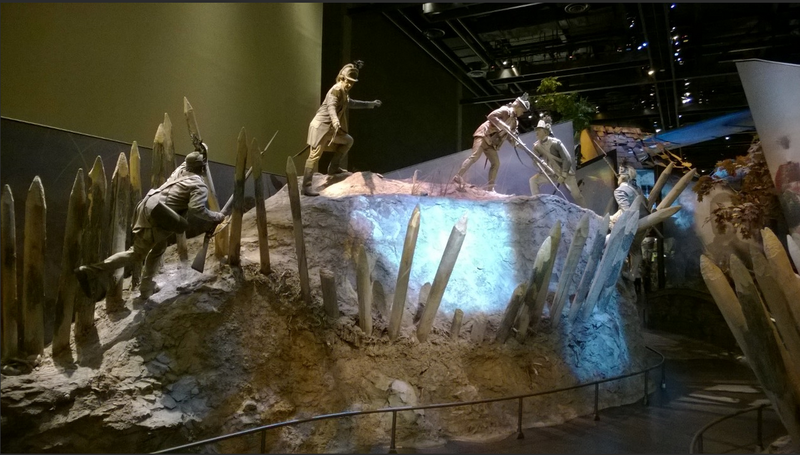 Also check out Bert’s excellent summary of the Battle of Cowpens.